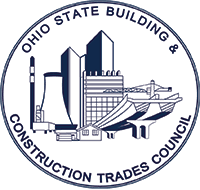 The individual member affiliates of the Ohio State Building & Construction Trades Council are comprised of thousands of highly-trained and experienced workers, whose track record of producing quality work resonates throughout the state of Ohio. It’s the mission of the OSBCTC to provide members with the necessary education and training to better skills and maintain productive and safe working environments. The OSBCTC is an umbrella group comprised of local construction unions and their members who work in Ohio. The Council is affiliated with the Building and Construction Trades Department, AFL-CIO. They provide leadership through direction and cooperation from 14 regional councils. Under the leadership of Secretary-Treasurer Michael Knisley and President Mark Douglas, Ohio’s statewide construction council has advocated vigorously to protect and ensure the rights of their affiliated members, by educating business leaders and government officials on the many advantages of the union construction industry.